The PieMenu provides a radial context menu as an alternative to a traditional menu. All of the items in a PieMenu are an equal distance from the center of the control. By default, only the currently selected item's text is displayed above the menu. To provide text that is always visible when there is no current item, set the title property. 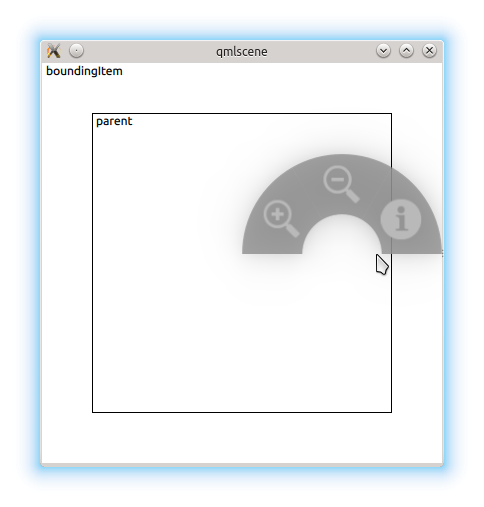 If the menu is opened in a position where some of its menu items would be outside of boundingItem, it is automatically moved to a position where they will not be hidden. 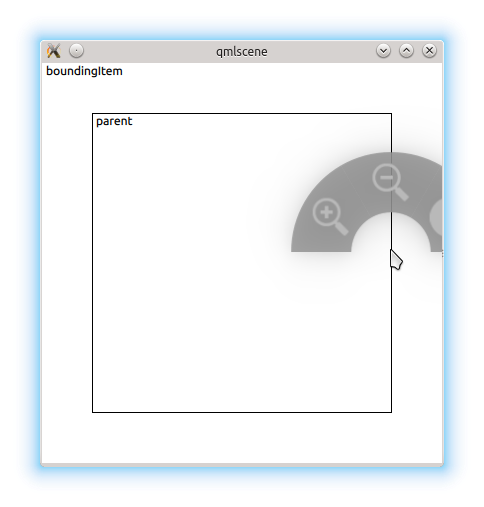 By default, the boundingItem is set to the parent of the menu. It can also be set to null to prevent this behavior. PieMenu can be displayed at any position on the screen. 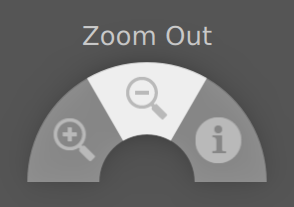 With a traditional context menu, the menu would be positioned with its top left corner at the position of the right click, but since PieMenu is radial, we position it centered over the position of the right click. You can hide individual menu items by setting their visible property to false. Hiding items does not affect the startAngle or endAngle; the remaining items will grow to consume the available space. The item which the menu must stay within. A MouseArea that determines the clickable area within which the menu can be opened. The bounds that the menu must not go outside of. The user can only open the menu within the inner rectangle. In this case, they've opened the menu on the edge of the MouseArea, but there would not be enough room to display the entire menu centered at the cursor position, so it was moved to the left. By default, the menu's parent is the boundingItem. The index of the the menu item that is currently under the mouse, or -1 if there is no such item. The menu item that is currently under the mouse, or null if there is no such item. The list of menu items displayed by this menu. This property reflects the angle (in radians) created by the imaginary line from the center of the menu to the position of the cursor. Its value is undefined when the menu is not visible. This property defines the text that is shown above the menu when there is no current menu item (currentIndex is -1). The default value is "" (an empty string). This property determines the method for selecting items in the menu. A triggerMode of TriggerMode.TriggerOnPress means that menu items will only be selected when a mouse press event occurs over them. A triggerMode of TriggerMode.TriggerOnRelease means that menu items will only be selected when a mouse release event occurs over them. This means that the user must keep the mouse button down after opening the menu and release the mouse over the item they wish to select. A triggerMode of TriggerMode.TriggerOnClick means that menu items will only be selected when the user clicks once over them. Warning: Changing the triggerMode while the menu is visible will result in undefined behavior. Adds an item to the end of the menu items. Equivalent to passing calling insertItem(menuItems.length, text). Returns the newly added item. Inserts a MenuItem with text before the index at before. To insert an item at the end, pass menuItems.length. Returns the newly inserted item, or null if before is invalid. Opens the menu at coordinates x, y.
Removes item from the menu.